I was at the end my proverbial rope. It was the middle of December and I could not wait until it was January. In fact, I was so stressed that I wanted to sleep for the next eleven days, but I knew that couldn’t happen. Apparently it would have been frowned upon by my husband and child. And potentially my mother, mother-in-law…well, you get the picture. 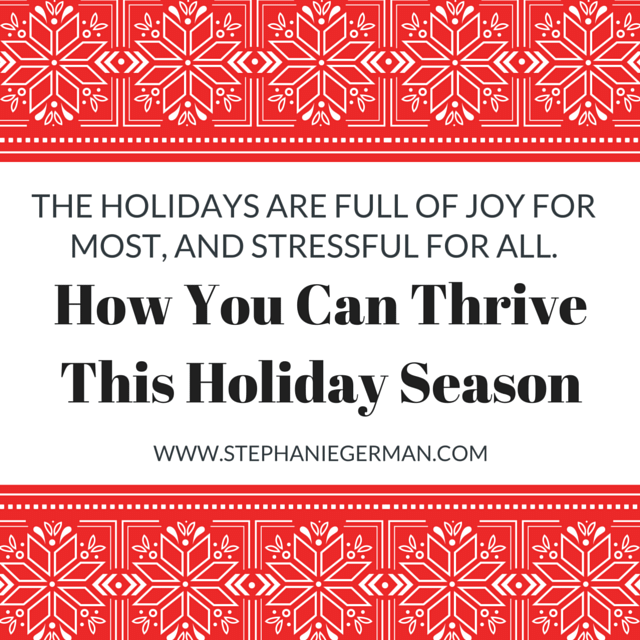 The holidays are full of joy for most, hard for those who may be spending them without a loved one, and stressful for all. The holiday season really begins in the middle of October, planning and preparing for Halloween, and lasts all the way through the New Year. If you don’t plan it well, instead of it being a joyful and fun time of year, it can be stressful and full of regret. I finally got smart (well, smarter than I was at least) and decided to plan out our time. Starting in November, we have family birthdays, my best friends birthday, Thanksgiving, my birthday, my husband’s birthday, Christmas parties (and holiday parties, not to be confused with Christmas parties), and New Year’s. And of course finding a time to meet with Santa (the kids, not me…maybe). Instead of spending two months in pure chaos, I decided I was going to thrive this year. First thing you need to do is pull up your calendar. I did this a couple of weeks ago and decided to make appointments for myself and our family. That is how I get everything else done, so why change a proven method? You will need to do the same. Does your family have traditions? When I hear the word traditions I used to think it had to be something elaborate. Traditions are the things we do every year around specific events. We don’t see our neighbors often and this is a fun way we can interact with them. My husband loves to make toffee and caramels while I love to make cookies. We have our oldest daughter help with the cookies, until she gets bored, but she loves handing the goodies to our neighbors! This one is for the kids. I like to make the cut out cookies and then give the kids everything they might need, or want, to decorate the cookies. We usually give these to family members (because grimy little fingers). Yep, we go see Santa. In fact, this year we will be going on December 9th if anyone wants to come with us! We have two awesome neighborhoods in our town that decorate their houses for the holidays. We grab coffee and hot chocolate, bundle up, and make an evening of it. It is so much fun to see the creativity and all the beautiful lights. Action: Make a list of your favorite traditions and put them in your calendar. Parties, parties, and more parties seem to fill up the months of November and December. I make sure to know in advance when birthday parties or dinners are happening. My people are extremely important to me and I want to make sure they know it! We have a couple of good friends who have Christmas parties. I make sure to find out the dates so we don’t plan something when they are happening. My husband’s birthday is 4 days before Christmas so I always make sure to make his birthday a big deal and separate from any Christmas activities. And of course my birthday, which I would celebrate all month long if I could, but apparently I have to share with my husband and Jesus. Action: Between the traditions that are important to you and your family, and holiday parties, make sure you put them on the calendar. This gives you the opportunity to make sure you do not have too many events going on in a two week span, but ensures you give yourself some down time. This season is busy and stressful enough. Often I wonder how I get through it. I learned this gem last year. If it doesn’t fit into my priorities, or if it adds to my stress, then I say no. You must know what your priorities are and be able to say no when it is going to cause undue stress on you. Action: Know your priorities in advance so you can say no. One year we waited until Christmas eve eve to buy my in-laws their gift. This was not intentional, as we knew what we were going to buy, but couldn’t find it. The day before we were to be at their house we went on hunt to find it. And we did, by 9 pm. Make your list NOW of everyone that you want to bless by giving a gift to. If you are going to make it, plan a time now to make those items. If you are going shopping, plan a time for when you are going to go shopping. With a little bit of forethought and planning, you won’t be scrambling to get gifts for your loved ones. Action: Plan out your gifts now and get going! The holidays can be stressful, but they don’t have to be. Put in the effort on the front end to plan out the next month. Your blood pressure and family will thank you.